It’s the age-old question: How do you choose the best melon? 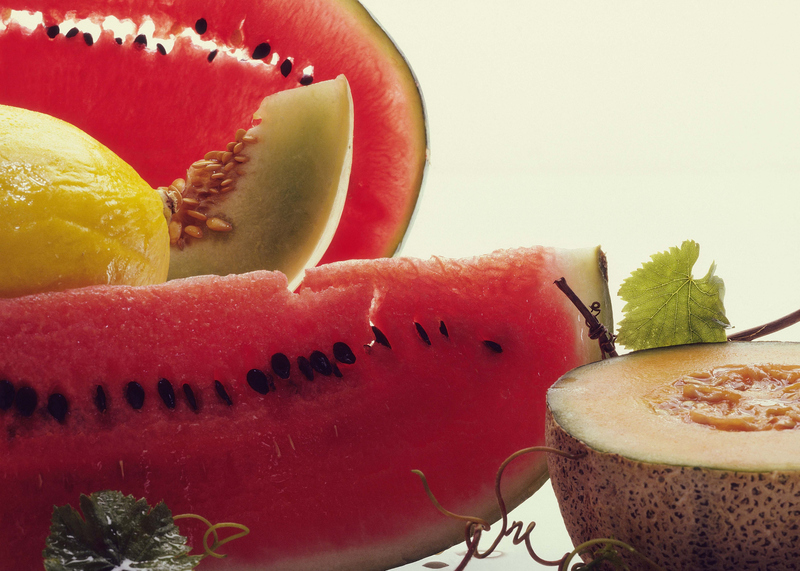 Whether it’s watermelon, cantaloupe, honeydew or other melons, summer days (or any day!) is a wonderful time to indulge in these delicious, nutritious fruits. Watermelon, cantaloupe and honeydew melons. Not only do these fruits taste wonderful, they are healthy low-calorie treats that are packed with vitamins. For example, a cup of cantaloupe has 60 calories and is rich in vitamins A and C, while a cup of honeydew has 64 calories and is rich in vitamin C and potassium and provides B vitamins. A cup of watermelon has about 45 calories and has significant amounts of vitamins A and C.
Watermelon is also 93 percent water, and the red variety is a good source of lycopene, a phytonutrient that gives watermelon its color. Lycopene appears to protect the body against a growing list of cancers, which include prostate cancer, breast cancer, endometrial cancer, lung cancer, and colorectal cancers, according to an Ohio State University Extension Ohioline fact sheet. Another benefit is that lycopene helps protect cells in the body from damage associated with heart disease as well. When choosing the perfect cantaloupe, it is important to make sure the melon has no bruises or discolorations, a smooth, slightly sunken and well rounded stem end, a sweet, musky aroma and a prominent, an evenly distributed corky web-pattern that is buff or a light tan color on either a green, yellow or gray background. Ripe honeydew should have a creamy yellow color when picked — if the melon is green when picked, it will never ripen, according to the OSU Extension factsheet. The skin should have the feeling of velvet and the blossom end should feel slightly springy. Look at the spot where the melon has been resting on the ground. A pale yellow or cream spot indicates ripeness, while a pale green or white spot indicates immaturity. Choose a melon that doesn’t have bruises, cuts or dents. Pick up the watermelon – it should be heavy for its size. As a watermelon is 93 percent water, most of the weight is water. If you are choosing pre-cut watermelons, the more red flesh and less white rind, the riper the melon. And remember, even though you typically don’t eat the peel from most melons, it is important that you wash the melon under running water before cutting into them. Melons are grown on the ground and can sometimes harbor harmful bacteria. Peeling or cutting unwashed produce can transfer dirt or other contaminates from the surface of the produce to the portion of the fruit or vegetable you plan to eat. In fact, firm produce such as melons should be scrubbed with a clean produce brush before peeling or cutting into them. And they should then be dried off with a clean paper towel or cloth to further reduce harmful bacteria that may be on the skin, according to the U.S. Food and Drug Administration. I want to have children at some point in the near future. My mom says that the types of foods both my husband and I eat could help impact my chances of conceiving. Is that true? Healthy foods that are good for the heart and overall health. It’s well-known that eating healthy, incorporating plenty of exercise into your normal routine and maintaining a healthy weight contributes to your overall health and well-being. And, according to the Academy of Nutrition and Dietetics, nutrition and a healthy body weight for both partners can have a significant impact on the ability to conceive. The issue is significant for many people considering that some 10 percent of the population is impacted by infertility, according to the American Society for Reproductive Medicine. The Alabama-based multidisciplinary organization says that achieving and maintaining a healthy weight can increase a woman’s chance of getting pregnant. For example, women who are underweight, with a body mass index below 18.5, may experience irregular menstrual cycles or stop ovulating, the organization said. And for women who are overweight, losing as little as five to 10 percent of their weight could improve fertility, according to researchers with the National Institutes of Health. Following an overall healthy lifestyle including eating a nutritious diet, limiting — or eliminating — alcohol and caffeine consumption, and getting regular physical activity is especially important for women who wish to become pregnant. Achieving a healthy weight before conception also reduces risks for both mother and child. Be sure to talk with your doctor about these issues and potentially any others if you’re experiencing problems becoming pregnant. 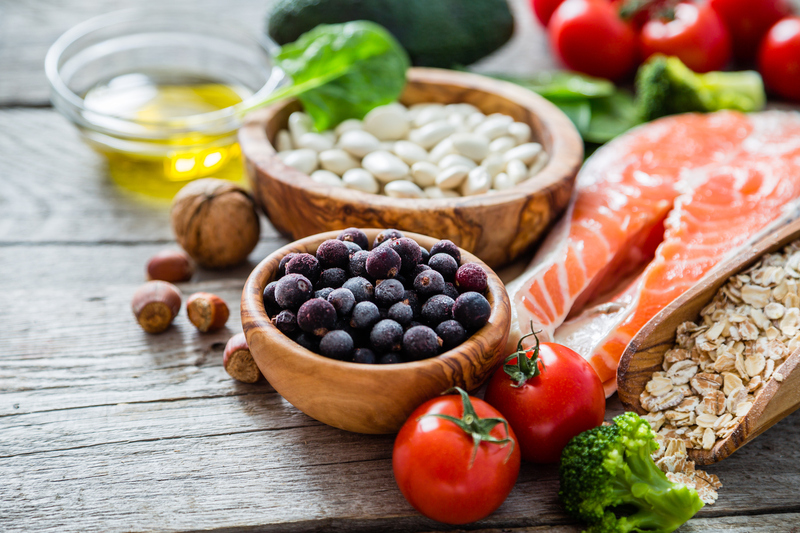 Foods like fruits and vegetables, foods rich in monounsaturated fats such as olive oil and avocados, lean meats rich in iron, and foods rich in complex carbs such as whole grains and legumes are also healthy choices for women who are preparing to become pregnant, according to the Nurses’ Health Study published by a team of Harvard University researchers. Smart diet and lifestyle decisions can also help with men’s fertility as well, according to the Academy of Nutrition and Dietetics. Those smart choices that can impact the health of a man’s sperm include eating more colorful fruits and vegetables such as apples, oranges, blueberries and leafy greens. Other smart choices for potential fathers include eating whole grains; low-fat dairy; lean protein such as fish, turkey and chicken; limiting saturated fats and fried foods; and adding almonds, walnuts and olive oil to the diet. While neither having a healthy diet nor taking other precautions can guarantee a pregnancy, making smart food choices can help in some cases, and can improve your overall health in general. I often find myself running out the door to avoid being late to work, so oftentimes that doesn’t leave me much time to eat in the mornings. What are some quick, easy breakfast ideas on a busy morning? Eating a meal in the morning helps your body fuel up for the day, especially if you make that first meal a healthy one. Eating a meal in the morning helps your body fuel up for the day, especially if you make that first meal a healthy one. The best options for breakfast are those that include whole grains, protein, and fruits or vegetables, according to researchers at Harvard University Medical School. 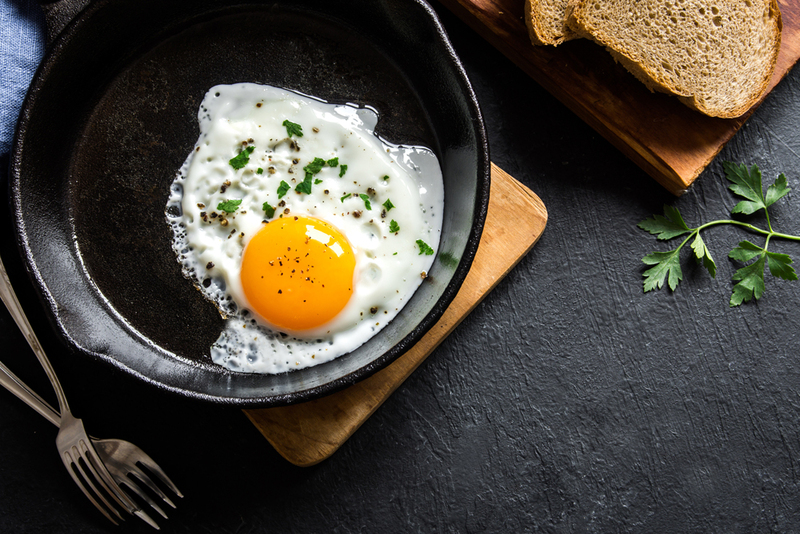 Healthy breakfast options also include low-fat or fat-free milk and other dairy items, meats, and meat alternatives, according to the U.S. Department of Agriculture. The benefits to eating breakfast are many. Adults who regularly eat a healthy breakfast are more likely to control their weight, control their blood sugar levels, eat fewer foods that are high in fat and cholesterol, and perform better at work, according to the Mayo Clinic. Kids who regularly eat a healthy breakfast are more likely to have better concentration, miss fewer days of school, maintain a healthy body weight and better meet daily nutrient requirements, the Mayo Clinic says. So how can you eat healthier in the mornings? Try adding whole grains to your morning meal, such as whole-grain rolls, bagels, English muffins or waffles. You can also get a good source of whole grains from hot or cold cereal — just make sure it lists whole grains, has 5 grams or more of fiber per serving, less than 300 milligrams of sodium per serving, and less than 5 grams of sugar per serving, Harvard researchers advise. You should also make sure you include proteins in your meal, such as eggs, lean meat, nuts, legumes or even peanut butter. For low-fat dairy options, you can include skim or 1 percent milk, yogurt and cottage cheese. Don’t forget to include fruits and vegetables in your meal. And if you choose to include juice, be sure to choose 100 percent juice without added sugar. You shouldn’t have more than an 8-ounce glass, which is a standard serving, because juice is still high in calories. Smoothies can be a good choice, including those that combine fruit, juice, yogurt, wheat germ or tofu. Get organized the night before. Set the table with bowls and spoons for cereal. Get out a pan for pancakes or a blender for smoothies. Prepare muffin or waffle mix so it’s ready to cook in the morning. Pack your breakfast to go. My boyfriend insists that we have to rinse off all fruit before eating it – even watermelon, kiwi and cantaloupe. I say fruit that I cut to eat, like melons, doesn’t need to be rinsed first, and it’s OK to just wipe off an apple or grape before popping it into your mouth. Who’s right? 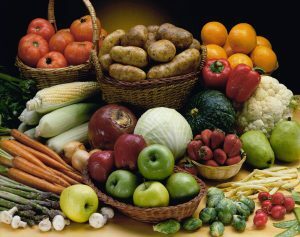 Close-up of various fruits and vegetables. Eating fresh fruits and vegetables is a great choice that promotes a healthy diet. As such, the U.S. Dietary Guidelines suggest you should fill half your plate with colorful fruits and vegetables at each meal. But, because fruits and vegetables can sometimes harbor harmful bacteria, it is important that you rinse all produce under running water before preparing or eating it. That includes fresh produce that was purchased from a grocery store, a farmers market or even grown at home. And, yes, even some fruits and vegetables that have skin need to be rinsed under running water before preparing or eating them, even if you do not plan to eat the skin. For example, cantaloupe skin has nooks and crannies that can house dirt particles. You should give cantaloupes a good rinse and scrub them with a clean brush before you cut through them with a knife. That is because peeling or cutting unwashed produce can transfer dirt or other contaminates from the surface of the produce to the portion of the fruit or vegetable you plan to eat. In fact, firm produce such as melons, apples and cucumbers should be scrubbed with a clean produce brush before peeling or cutting into them. And they should then be dried off with a clean paper towel or cloth to further reduce harmful bacteria that may be present on the skin, according to the Food and Drug Administration. Sprouts are among the vegetables that cause a high number of outbreaks. They have to be thoroughly washed before consuming. Vegetables like broccoli, lettuce and leafy kale should be rinsed under cold water just before you intend to eat them. However, don’t wash berries before putting them in the fridge because that will increase moisture and accelerate growth of spoilage bacteria and molds. It is important to note that most fresh produce is eaten uncooked and there is no way to kill any harmful bacteria that may be present. This is where proper food safety handling comes into play. To lessen your chance for contracting foodborne illness, it is important that you not only wash fresh produce before preparing or eating it, but you should also wash your hands for at least 20 seconds with soap and warm water before and after preparation, FDA says. So even though it may be quick and easy to just shine that apple on your shirt or wipe off those grapes and cherries with a quick swipe of your hands, don’t do it. Take the extra step to avoid the potential for foodborne illness. Understanding food safety is an important step to avoiding foodborne illness. Some 48 million people get foodborne illnesses, leading to 128,000 hospitalizations and 3,000 deaths each year, according to estimates from the Centers for Disease Control and Prevention. Several groups of microorganisms can colonize or contaminate fruits and vegetables at any point in the food supply chain, according to food safety experts. Pathogenic bacteria such as Shiga toxin-producing E. coli, Salmonella, Listeria monocytogenes and viruses such as norovirus are commonly associated with consumption of fresh produce. While washing produce is important, washing will not get rid of all bacteria or viruses. And washing with soap, detergent or commercial produce washes is no more effective than water. In fact, those products aren’t recommended at all, FDA says.